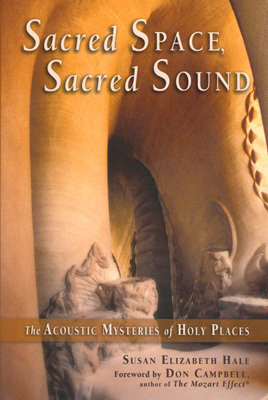 The Acoustic Mysteries of Holy Places. Together we stood in awe in the Gallery of Bulls in the prehistoric cave of Lascaux. No more words. No more questions. Only five trembling humans, strangers from different countries, forever linked to this place…Sounds rose from within. The cave was telling me how to sing…I heard an echo, my voice reflected back by the bison, no longer just my voice, but the bison’s voice, the voice of the cave itself. There is a fundamental human need to create sacred spaces where sound reverberates to commune with the ancestors and give praise to the Divine. Ancient people recognized the importance of sound and sought out resonant caves to perform rituals. Modern-day temples and cathedrals were built to enhance sound and music. We build sacred places to house music, to hear ourselves and Spirit more clearly, and to create relationship between the seen and the unseen worlds within and around us. "The voice itself is a cathedral," says Susan Hale, author of Sacred Space, Sacred Sound. "We are sound chambers resonating with the One Song." The first of its kind to approach sacred architecture from a perspective of sound and consciousness, this book explores the acoustics of sacred space as an avenue for understanding. It is about music powerful enough to transform us into a greater reality. Based on Susan’s life-long experience as a singer, 27 years as a music therapist, and 10 years of journeys across the globe researching sacred sites, this work discusses the desecration and disharmony of our current world while demonstrating how people are building new sacred sites with resonant qualities. Starting with a vision to follow the Virgin Mary—also called the Lady of Roses—and her music, Susan takes us on a spiritual journey through France, the United Kingdom, and parts of the American Southwest—from the Chartres Cathedral and the prehistoric cave of Lascaux, to the Templar-built Rosslyn Chapel in Scotland, the Chalice Well of Arthurian lore at Glastonbury, and back on domestic soil to the native kivas in New Mexico. Susan compares different styles of worship through the perspective of music and architecture, focusing on a range of religious traditions including Gregorian chant, overtone chanting, Hindu mantra, and English evensong. She also illustrates the importance of sound in achieving altered states of consciousness for transformation, healing, and prayer. Featuring interviews with leading authorities on the acoustic resonance of sacred space, a discography and suggested listening at the end of several chapters, this book gives us the tools to find our own sacred voice.